Whether you're opening your first location or your 500th, Staples® has everything your retail business needs. From POS systems and tablets for the sales floor to coffee, water and cleaners for the backrooms, we're your one-stop shop. Increasing foot traffic in a new era. Getting customers in the door is the first step for any successful retail store. But keeping them is key, and here are a few ideas for your business. 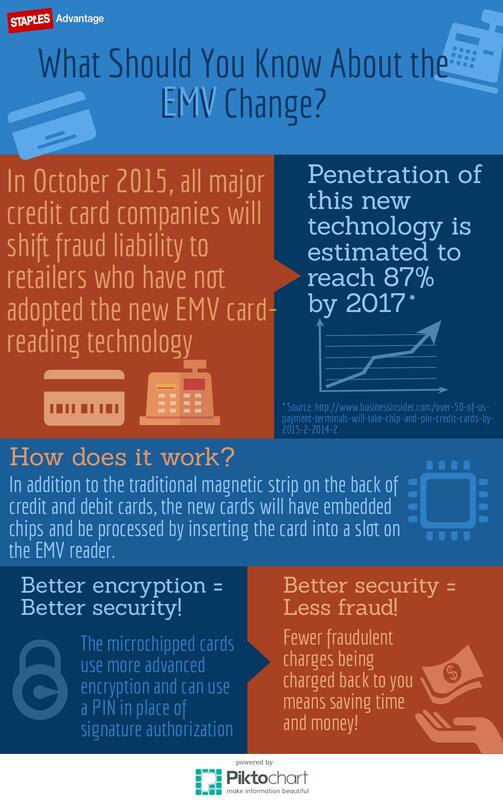 If you haven’t started using an EMV reader for your credit card sales, you could be held responsible for fraudulent transactions. Cutting costs with a turnkey solution. New stores were opening up to five times a month and this nationwide electronics retailer needed to cut costs and streamline procurement. How poor service hurts your business. Not only does poor service result in the highest rate of customer change in the retail industry, It can cause other issues for your business as well. Service (and sales) with a smile. Happy customers mean more traffic and bigger baskets, but it all starts with a motivated, engaged staff and we've got the tips to get started. Paper or plastic? Maybe neither. With local ordinances around the country banning some kinds of bags, the question of “paper or plastic” may soon be a thing of the past. What’s a retailer to do? From the front counter to the back room. Floor displays, pricing tools, receipt paper, mannequins - everything you need to show off your assortment. So whether you run a small boutique or a nationwide chain, we've got what it takes. Keep your stores safe, clean and inviting with all the top brands in cleaning supplies, floor equipment, tissue and more. Staples® Facility Solutions has what you need to stay spotless year round. Technology can do more for your business than you might realize, including tablets that can take payments and security cameras that keep tabs on the sales floor. Stay up-to-date with Staples® Technology Solutions. From window signs to in-store displays and direct mail, custom print can reach your customers and bring them in the door. Got a product? We can provide labels and packaging solutions, too. Coffee and water, sweet and salty snacks, healthy must-haves — stock up on everything your employees crave to keep them fueled throughout the day, plus the paper products and cleaners to keep the office tidy. When accidents happen in the workplace, you need to be ready. So protect your customers and your employees by stocking up on the safety supplies they count on in the event of an emergency. Staples offers a world-class product selection to furnish your sales floor, administration offices, breakrooms and other areas. We offer space planning, installation and more. Create a totally branded experience for your customers, including personalized staff uniforms, giveaways and more. Add your logo to thousands of products with Staples Promotional Products®.